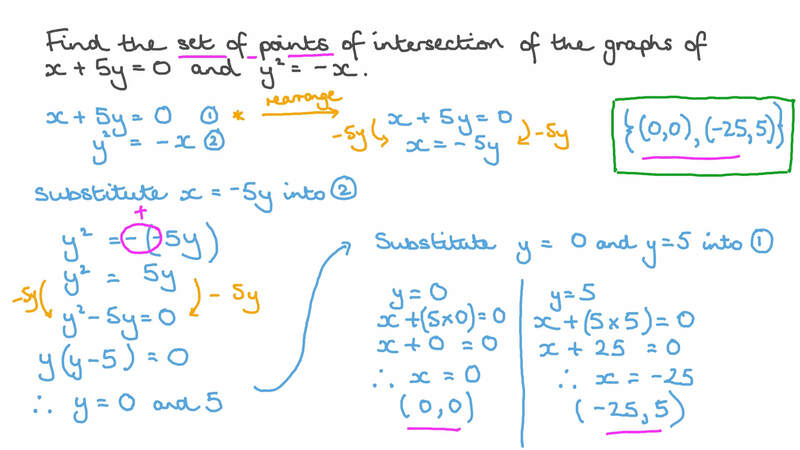 In this lesson, we will learn how to solve linear-quadratic systems of equations. Find all of the solutions to the simultaneous equations 𝑦 + 𝑥 = 7 and 2 𝑥 + 𝑥 + 3 𝑦 = 2 1 2 . Find the set of points of intersection of the graphs of 𝑥 + 5 𝑦 = 0 and 𝑦 = − 𝑥 2 . Given that 𝑥 + 𝑥 𝑦 = 1 8 2 , and 𝑥 + 𝑦 = 6 , find the value of 𝑥 . Find the set of points of intersection of the graphs of 𝑥 + 𝑦 = 8 and 𝑥 + 𝑦 = 5 0 2 2 . Find all of the solutions to the simultaneous equations 𝑦 + 2 𝑥 = 3 and 𝑥 + 𝑥 𝑦 + 𝑦 = 3 2 2 . 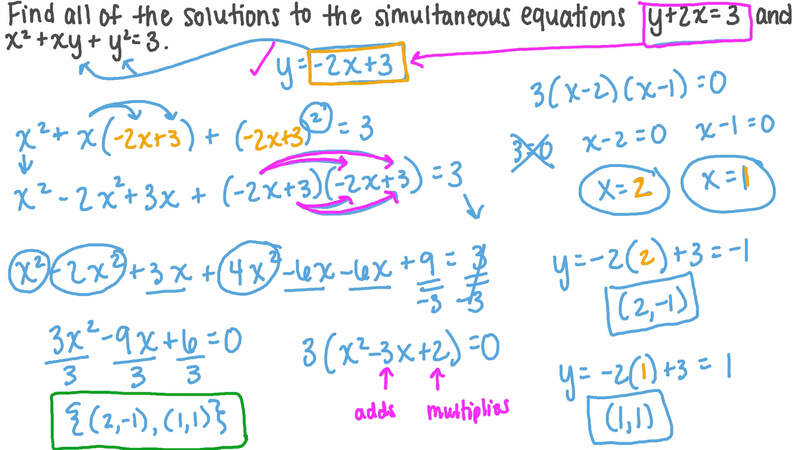 Find all of the solutions to the simultaneous equations 𝑥 − 𝑦 = 2 6 and 𝑥 𝑦 = 1 2 0 . Solve the simultaneous equations giving your answers to two decimal places. 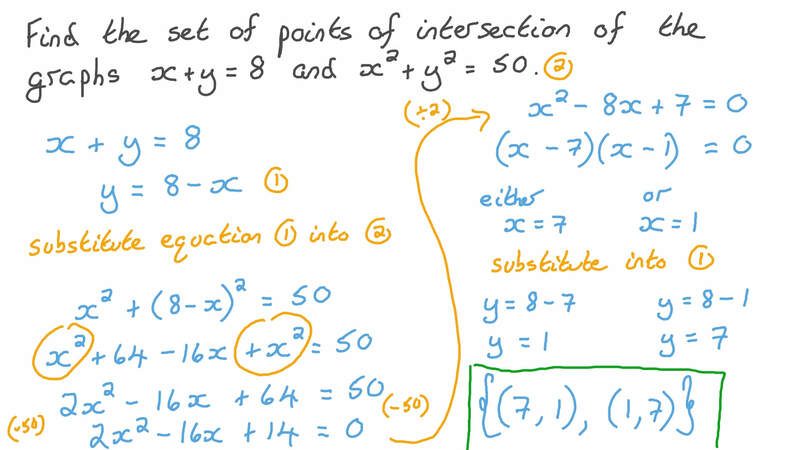 Find all of the solutions to the simultaneous equations 𝑥 − 𝑦 = 6 and 𝑥 − 9 𝑥 𝑦 + 𝑦 = 3 6 2 2 . Find the set of points of intersection of the graphs of 𝑥 − 𝑦 = 0 and 6 𝑥 − 𝑦 = 4 5 2 2 . Find the set of points of intersection of the graphs of 𝑥 = − 6 + 𝑦 and 𝑥 − 𝑦 = 2 4 2 2 . Find the set of points of intersection of the graphs of 𝑥 + 𝑦 + 6 = 5 and 𝑥 − 𝑦 = 3 5 2 2 . Find the set of points of intersection of the graphs of 𝑥 − 𝑦 = − 7 and 𝑥 + 𝑦 − 2 𝑥 𝑦 + 5 𝑦 = 1 4 2 2 . Find the set of points of intersection of the graphs of 𝑥 + 1 0 𝑦 = 5 and 1 0 0 𝑦 − 𝑥 = 7 5 2 2 . Given that 𝑦 = 4 − 𝑥 and ( 𝑥 + 𝑦 ) + 𝑦 = 1 2 , find 𝑦 . Solve the given simultaneous equations. The sum of two numbers is 11 and the sum of their squares is 65. What are the numbers? Two numbers have a difference of 6. If the sum of their squares is 68, what are the numbers? A father’s age is 10 more than 2 times his son’s age. The sum of the squares of their ages is 4 more than 3 times the product of their ages. What are their ages? A right-angled triangle has a hypotenuse of 35 cm and a perimeter of 84 cm. Find the lengths of the other two sides. The difference between the perimeters of two square gardens is 4 m and the difference between their areas is 39 m2. Find the side length of each garden. What is the 𝑥 -coordinate of the point where the line 2 𝑥 + 𝑦 = − 1 1 meets the curve 𝑦 = 4 𝑥 + 4 𝑥 − 3 2 ? Find the two points on the line 1 8 𝑥 − 𝑦 = 1 2 with a 𝑦 -coordinate which is six times the square of the 𝑥 coordinate. Given that ( 𝑎 + 6 , − 4 ) =  𝑏 , − 4 𝑏  2 , determine the values of 𝑎 and 𝑏 . Given that 𝑚 𝑎 = 6 and 𝑚 𝑎 = 2 4 2 , determine the value of 𝑎 .